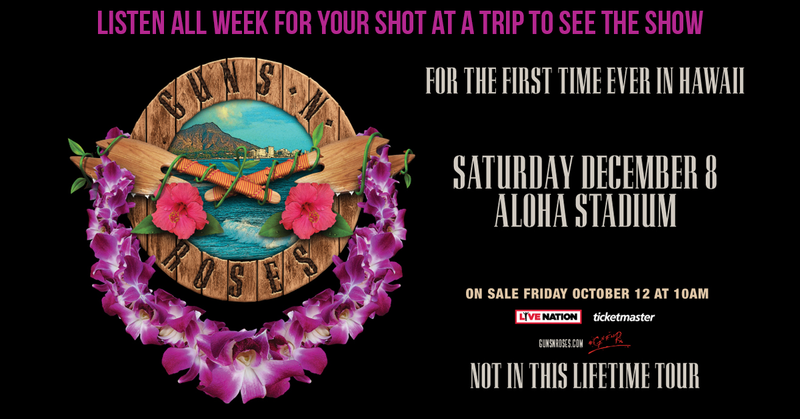 GUNS N’ ROSES ANNOUNCED THEIR FIRST EVER SHOW IN HAWAII! THEIR NOT IN THIS LIFETIME TOUR CRASHES INTO HONOLULU’S ALOHA STADIUM SATURDAY, DECEMBER 8TH. KEEP IT LOCKED ON 95.5 KLOS ALL WEEK LONG, AS WE’RE GIVING AWAY A TRIP TO SEE THE BAND IN HAWAII!